Where dependent car parking works? MODULO parking platforms are divided into two types of systems: dependent and independent. Today we would like to introduce you to the dependent types which is this case means the upper car is dependent on the lower car being moved prior to accessing. Dependent systems are usually desired by individual users and is a great solution to problems with parking in home garages and also for commercial events such as exhibitions and car show rooms. Is a system based on a unique scissor mechanism. This allows for extreme comfort and at the same time is very visually attractive, storing two cars using only one traditional parking space. This solution is ideal for collectors and car dealers who want to present vehicles sold in an interesting way, while saving space. SCISSOR is also great for all kinds of fairs and motor shows. One of its advantages is the possibility to fold flat, which undoubtedly facilitates transport and storage. This system can also be used outdoors. Dependent parking System Modulo Scissor at fairs. This parking system is designed for facilities that require a small amount of parking spaces, for example: small businesses, hospitals or hotels. It is extremely easy and convenient to use and what is more – its width is exactly 2.5 m, so only as much as one standard parking place. Additionally, through the use of higher poles there is a possibility of individual height selection. One of the advantages of the POLO Parking System is also the fact that the platform’s outline covers the whole parking space below, which provides additional cover for the car located there. MODULO SLANT is a system that works great in places with limited height – the upper platform is inclined to the bottom and lowered at a small angle, which maximizes the available space. This solution is ideal for underground garages with low ceilings, commercial buildings, public institutions and apartments. 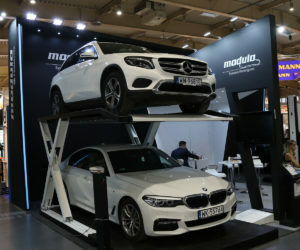 It also happens to be the lightest of all MODULO Parking Systems and most importantly it is just 2.5 m wide, which is the same as a standard parking space, so no additional space is required. In the next article we will present our independent MODULO Parking Systems.